Our 10 yard dumpsters are a perfect size for homeowners handling a basement clean out, garage clean out, or even for yard work around your home. These compact dumpsters main purpose are for removal of debris from smaller construction projects. 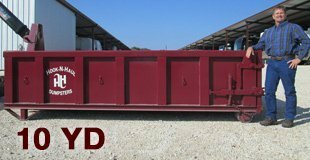 The 10 yard dumpster is also the dumpster size we recommend for removal of heavier objects, or difficult load materials. This is the dumpster many customers or construction workers use for concrete demolition, or landscapers will use for sod tear out or dirt removal. This economical and compact size is great for driveways and tight spaces. The 10 yard dumpster is also an ideal choice, when you have a smaller space you are working with. When you are unsure about the size of your load and what dumpster rental size you need to accommodate your home project or construction job then just give us a call. 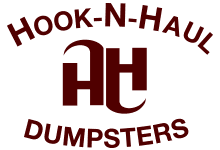 We have had years and years of experience estimating the sizes of dumpsters for any type of job you could think of so when in doubt, just call us up and we will be happy to assist you with any questions you may have.